Rampart Street is a 19th-century merchant house restored and refurbished as a modern holiday home. Located inside the walls of the historical Galle Fort that dates back to the 17th-century, the bungalow is something extraordinary with rustic interiors speckled with modern accents to bring you the best of everything. Enjoy a majestic view of the fort from where you are and head out to the streets of Galle bustling with excitement around local vendors, boutiques, and cafes. 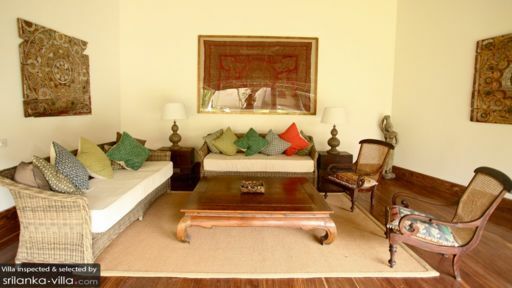 The bungalow houses four, excellent bedrooms designed in a manner that breathes Sri Lanka’s rich, colonial past. There are four splendid bedrooms at Rampart House, each designed with the same care and artistry as other parts of the bungalow. The rooms are furnished with four-poster king-sized double or single beds with drapes white mosquito nets to keep you comfortable. Also featuring antique furniture, the bedrooms are truly dated and exude an old-world charm so hard to find. All four bedrooms are air-conditioned and come with en-suite bathrooms. Large windows keep the rooms well-lit and ventilated. The beauty of this gorgeous house lies in the fact that it accommodates everything you’d seek in a tropical vacation home and yet it remains in the city. The stunning swimming pool lined with blocks of stone and surrounded by luscious foliage invites you in to take a dive. The garden beside the pool has numerous sun loungers for you to relax on while sunbathing or tanning. The stone walls of the fort keep it all private and personal shielding you from prying eyes and at the same giving you a nostalgic vibe. There are two living areas at Rampart street, one that is open-plan beside the swimming pool and the other that is more opulent with rich interiors, selective artwork, and lattice work on the window frames. The living rooms are furnished comfortably to provide you with corners you can easily retreat to once the sun sets and you wish to lie back and relax. The cosy interiors are definitely homely and the antique, vintage furnishings only add to this luxe vibe. There is a TV room at the bungalow as well for anytime you want to watch a few films or catch up on your favourite shows. Guests of the bungalow are spoilt for choice when it comes to where to hang out as you can do so outdoors and the same indoors. There is an outdoor, alfresco-style dining area with a round table to dine under the stars or have a hearty Sri Lankan or Western breakfast to the sounds of birds chirping. A second dining area is found under a pavilion also open-sided with a more formal aura. The kitchen is again fully-equipped and you can request for a chef to prepare delicious local delights for you. The staff is generous and helpful ensuring you settle in without any problem. There are plenty of services available for a small cost such as car and driver, meal preparation, massages, etc. Rampart Street has been built in the best possible location in Galle, Sri Lanka. You can easily enjoy the sights of the Galle Fort – a UNESCO World Heritage Site and also head out about town. If you’re adventurous, definitely arrange a trip to Yala National Park or go whale and dolphin watching at Mirissa. 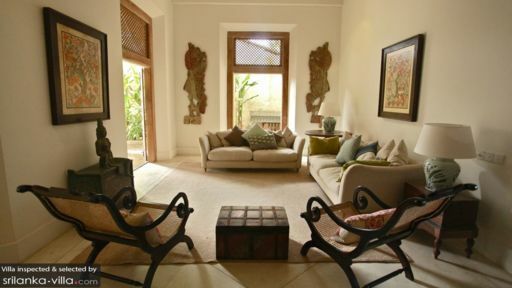 Perfectly set in Galle with views of the fort walls, this house is an absolute gem! The spacious rooms with architectural features and antique furnishings give real character, while the master bedroom with a stand alone bath overlooking the rampart was simply breathtaking. Manoj was a great host and I hope I have the opportunity to visit the house again. Absolutely heavenly! The accommodation was stunning with what can only be described as the most incredible view of the sea, it was paradise. Staff were extremely friendly and cooked the most delicious food! This place is simply stunning. You feel regal just walking around the house (palace?). Looking out of the master bedroom you see over the ramparts and out across the ocean. You get the same view from the windowside tub in the huge ensuite bathroom. The dining/living area is open so you don't feel like you're inside, which is great when it's sunny but was also incredible when a sudden intense rain shower hit and we experienced it without getting wet - exhilarating. I thought the location was perfect - on the edge of Galle Fort so that you're within walking distance of everything but without any noise, hoards of people trawling past etc. Loads to see in the maze of old streets just behind the house which lead through the Fort. The staff were absolutely wonderful, always smiling and incredibly helpful. They cooked us some quite spectacular meals. If we go back to Galle Fort, we will definitely be staying here again. Fingers crossed. After exploring everything Sri Lanka has to offer from temples and tea plantations to national parks and safari, Rampart Villa was the perfect hideaway with its tranquility, privacy and exclusivity to return to. The in-house staff were incredibly charming and welcoming and catered to all our needs be it cooking a delicious and authentic Sri Lankan meal to organising a TukTuk for our travels. The abundant living space was incredibly designed and furnished with elegant antiques, fit for royalty. The master bedroom has a four poster king-size bed in the center with views of the rampart and sea. The en-suite has a huge, luxurious bath also overlooking the sea. I couldn't think of a way to improve the place, it's truly special and I would absolutely love to return. What an incredible house with great staff, Minoj and his team were so attentive and helpful. 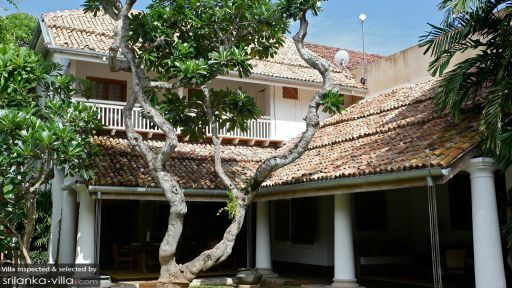 The house itself is with the walls of Galle Fort and a stones throw away from the sea. It's spacious, clean and welcoming. One of the best holidays I have ever been on. It was absolute paradise staying at this house. The rooms are all huge with amazingly comfortable beds and on suite bathrooms. It's opened planned setting meant that you could eat and relax in the shade but still be outside. Galle Fort is a magical place and Manoj who runs the house looked after us so well and cooked delicious meals. I highly recommend it! Wonderful country, great town, delightful house, brilliant views over the ramparts. SUPERB STAFF!!! The house is restful, peaceful, cool and full of history. Amitha’s cooking will be calling from afar. Manoj was wonderful too—he goes far beyond the call of duty in his care and affection for our children. What a fantastic place for a family holiday! Amitha and Manoj were calm, pleasant and helpful and really nice with children. Amitha’s food was really fabulous… Manoj knows all the best tuk-tuk drivers and is a fantastic source of local information.